We've started drawing maps of the area near the cache. When we sketch the maps, we find major reference points like roads, boreens, and water features. Then we use Google Street View to get more of an idea what the local terrain looks like. In some cases, a Picasa album puts the cache directly on a Google Map which feels like cheating except from a four-year-old's point of view, it's more like leveling the playing pitch. We discuss distances from where we might park the car or where we might step into a pasture. We've learned it takes longer to cross a wooded area than to walk a track abeam a field and approach from the shortest distance from a clearing. As a former Boy Scout, I really appreciate the ethos of Cache In Trash Out along the way. It's also a good lesson to pass to another generation, while having fun with a geocache. The biggest challenge I've had to surmount concerns battery power. 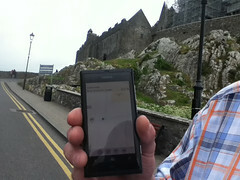 Using GPS and over the air services on the Nokia Lumia can flatten its battery within four hours. That won't do, so we normally walk the route into the geocache with all electronics muted. That ensures we have enough power to record the find and even share the joy with a digital upload from the field. I expect to share other geocaching notes during the summer as Mia becomes expert in Level Two Geocaching. Bernie Goldbach follows the geocaching conversation on Google Plus where he's http://gplus.to/topgold.